In ‘Clarifying the Crisis,’ published earlier this year in Jacobin magazine, the Canadian political economist Sam Gindin reasserted his view that the global economic crisis that erupted in 2008 ‘needs to be understood primarily as a financial crisis.’ To be sure, the U.S. financial crisis was the event that triggered the Great Recession, and Gindin is certainly correct that the recession ‘turned into such a generalized and profound economic catastrophe’ largely because of the size of the financial sector, global financial integration, and the securitization of mortgage loans. Yet has one really ‘clarified the crisis’ by saying only this and then quickly moving on, as he does? In the U.S., the TARP bailout, ‘stress tests’ of financial institutions, and other actions succeeded in quelling the financial crisis by mid-2009 at latest. Yet it is now five years later, and the U.S. economy remains mired in a state of near-stagnation with no clear end in sight. Austerity policies are certainly not the culprit; U.S. fiscal and monetary policies have been wildly expansionary. The public debt has risen by 88% since the start of 2008; the extra $8.1 trillion of borrowing, which has been used for increased government spending and lower taxes, amounts to about $4400 per person per year for six straight years. The Federal Reserve has kept the federal funds rate (i.e. the overnight interbank interest rate) near zero for five full years and has bought $3.6 trillion worth of securities since Lehman Brothers collapsed in order to lower long-term rates. Nonetheless, near-stagnation persists–­long after the financial crisis ended. Now, if it’s odd to say that persistent economic malaise is wholly a financial problem, it’s only slightly less odd to say that it’s primarily a financial problem. Gindin fails to grapple with this issue, and he therefore also fails to understand the ‘secular stagnation’ argument that has been a hot topic among mainstream economists since Summers’s speech. Responding to Michal Rozworski, who linked their worries about the possibility of secular (i.e. long-term) stagnation to his own view that ‘structural changes and imbalances in the economy’ date back to the 1970s, Gindin writes, ‘It is one thing to project a coming long period of stagnation, and another to identify this crisis as a continuation of something that has been going on for more than three decades’ (first emphasis added). This suggests that the economists who are discussing secular stagnation are referring only to the post-crisis economy. Actually, they are arguing that the fundamental underlying causes of both the Great Recession and the continuing malaise are non-financial problems that preceded the financial crisis. However, growth-rate figures aren’t very good measures of underlying economic conditions when government policymakers again and again prop up growth by papering over problems––artificially stimulating the economy with government borrowing, easy money, and policies that encourage excessive private-sector debt creation. I don’t think Krugman was exaggerating when he characterized former Fed chairman Alan Greenspan’s legacy as ‘one of replacing each bubble with another bubble.’ A better measure of the true state of the economy is the fact that, even with all the bubbles and artificial credit expansion, growth slowed down substantially. What would have happened under a genuinely laissez-faire regime? To be sure, one will not find ‘remarkable problems’ in the ‘real’ economy during the middle of the last decade if one looks only at conventional economic indicators while ignoring the fact that exceptionally expansionary monetary policy and loose credit standards were artificially stimulating production, employment, demand, and so on. But once one takes this fact into account, the mere lack of remarkable problems is what is so remarkable. We would normally expect the economy to be booming in such a situation. Yet, as Summers pointed out, there was no such boom. ‘Capacity utilization wasn’t under any great pressure. Unemployment wasn’t at any remarkably low level. Inflation was entirely quiescent. So, somehow, even a great bubble wasn’t enough to produce any excess in aggregate demand.’ Again, this suggests that stagnation had become the new default state of the economy even before the financial crisis erupted. In his effort to portray the crisis simply as a financial matter, Gindin comes close to denying that anything at all was amiss in the ‘real’ economy prior to the crisis, at least from capital’s perspective. The effective crisis since the early 1980s has not been that of capitalism’s weakness, but of the weakness of labour and the Left. While capital has prospered in terms of profits, accumulation and new opportunities, the devastation in workers’ lives and the explosion in inequality occurred with distressingly little resistance. However, although Gindin cites a lot of data elsewhere in his article, almost no hard evidence accompanies this account of capitalism under ‘neoliberalism,’ and the hard evidence fails to support much of it. Since something like this account has become conventional wisdom among much of the Left, it is important to review the facts in detail. Let me begin with workers’ supposed dependence on credit. Figure 1 depicts trends in household borrowing (there are no data specifically for ‘workers’). It shows, first, that the share of personal consumption spending funded by consumer credit––i.e. all household borrowing except for home mortgages––did not rise over time. In other words, consumption did not increasingly come to depend on consumer credit. Second, while there was a huge rise in mortgage borrowing as a percentage of consumption spending, that rise was limited to the period of the housing bubble, which began in the late 1990s. It was not characteristic of the ‘neoliberal period’ as such. Nor does the rise in mortgage borrowing seem to have been a disproportionately working-class affair. Almost 20% of all new mortgage loans made between 2004 and 2006 were subprime, but almost all the rise in mortgage borrowing occurred before then, when the subprime share of new mortgage loans was 8% or less. Finally, there is the phenomenon that Gindin highlights, that of people borrowing against their equity in their homes in order to sustain their consumption. 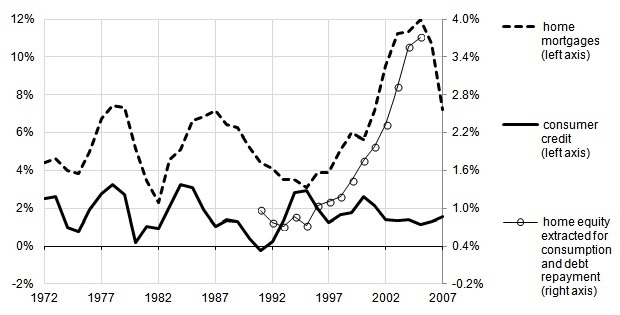 Information on such borrowing is not regularly collected, but the data plotted in Figure 1, which come from a study of the 1991–2005 period by Alan Greenspan and James Kennedy, indicate that home equity extractions to fund consumption and repay non-mortgage debt were closely tied to the housing bubble as well. They likewise did not begin to rise substantially until 1999. Yet if workers did not come to depend more and more on debt to sustain their consumption (except, perhaps, during the housing bubble), why didn’t consumption spending plummet as their incomes and ‘wages’ stagnated? The answer is that, while some parts of the working class suffered from ‘wage repression,’ the myth that this was true of the class as a whole is an artifact of peculiar definitions of ‘income’ and ‘wages.’ A remarkable recent study of U.S. household income by Armour, Burkhauser, and Larrimore looked at after-tax income, including transfer payments such as Social Security benefits and noncash income such as medical-insurance benefits, and adjusted for changes in household size. The authors found that the inflation-adjusted income of the middle 20% of households rose by 34% between 1979 and 2007, while incomes of the lowest and next-to-lowest 20% groups rose by 32% and 31%, respectively. And during the 1989–2007 sub-period, income inequality actually declined: these groups’ income growth outpaced that of higher-income households. In light of these data on wage and compensation growth, what would otherwise be an unbelievable fact is much less surprising––the fact that profit did not increase at the expense of employee compensation. 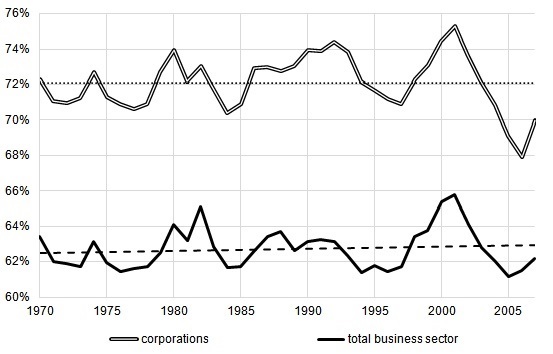 As Figure 2 shows, compensation did not fall as a share of net output between 1970 and the Great Recession, either in the U.S. corporate sector or in the business sector as a whole. And this implies that the remaining share––the profit share––did not rise. Beginning in 1980, there was indeed a sharp rise in property owners’ incomes (i.e. interest, dividends, rental income, and proprietors’ income) as a share of net output, as Figure 3 shows. Yet it rose at the expense of the remaining portion of profit, the portion not paid out in dividends and interest but retained by corporations themselves. It did not rise at the expense of working-class income (i.e. compensation of employees plus the government social benefits (minus the social insurance taxes that pay for some of them) that overwhelmingly accrue to poor and low-income people). 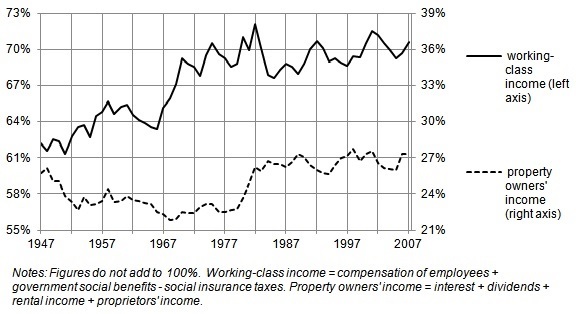 Working-class income in fact trended upward. This suggests that working people as a whole, including the poor, were able to buy a bigger share of the output than before––using only their income, not additional debt. In light of the failure of the profit share to rise under ‘neoliberalism,’ it should not be surprising that U.S. corporations’ rate of profit (i.e. rate of return on investment in fixed assets) also failed to rebound. Figure 4 presents three measures of their rate of profit, based on different definitions of profit. Net operating surplus is the most inclusive; after-tax profit is the least inclusive. All three rates of profit continued to decline. These figures pertain only to domestic profit and investment, but U.S. multinationals’ rate of return on their foreign direct investment also trended downward between 1983 (the first year for which data are available) and the Great Recession. Their profits from abroad increased very rapidly, but their investment abroad increased even more rapidly. Corporations’ rate of accumulation––i.e. net investment in fixed assets as a percentage of accumulated investment––fell even more sharply, as Figure 4 also shows. This long-term ‘investment dearth,’ as Martin Wolf has called it, is the key issue with which the current discussion of secular stagnation is grappling. When economists such as Summers and Krugman hypothesize that the ‘natural’ real short-term interest rate had become negative well before the financial crisis, what they mean is that the expected profitability of investment in production had fallen to such a low level that something approaching full employment was no longer sustainable given normal interest rates. Businesses would no longer invest at the pace needed to sustain full employment unless the interest they paid to fund investment projects was exceptionally low––low enough to offset the meagre returns they expected from such investments. There are no data on expected profitability, but it is clear from Figure 4 that there was a close relationship between movements in the rate of profit and movements in the rate of capital accumulation. This close relationship suggests that declining realized profitability lies behind the investment dearth. We need only assume that businesses’ profit expectations were more or less correct, on average, to conclude that declining expected profitability lies behind it as well. I agree with Gindin that ‘[t]he world of the late 19th century or the 1930s is radically different than the world of today’ and that ‘each crisis demands not an already-discovered general law but an analysis sensitive to its particularities.’ The problem is that his broad-brush, holistic account of the ‘neoliberal’ period is not sensitive enough to the details of the data. He is certainly right to warn against any effort to ‘squeeze… events into the straightjacket of a trans-historical causality (such as the falling rate of profit or production as the sole site of crisis-creation),’ but we should also be wary of efforts to dismiss the importance of factors such as the falling rate of profit and capitalist production in advance of careful consideration of the evidence––not to mention efforts to dismiss the evidence itself, which are unfortunately all too common. And we should be sensitive to the fact that the trade union bureaucracy that is the source of much of the Left’s economic information is predisposed to claiming that corporations are always awash in profits, and that the real problem is always the unequal distribution of the fruits of capitalism’s success—even in the face of the system’s descent into a crisis that now seems intractable. So, what should be done to confront the prospect of secular stagnation? 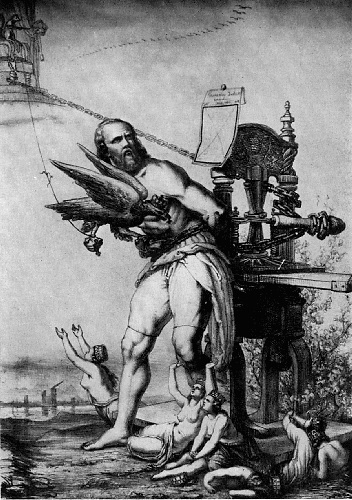 I wholeheartedly agree with Gindin when he writes that ‘[if] we don’t assert that we refuse to take it anymore, the other side will simply keep demanding more from us,’ and when he suggests that working people need to assert their ‘independence from capital’ and resist ‘integration … into the neoliberal project.’ Yet I would add that we also need to support and encourage working people’s efforts to assert their independence from the trade-union bureaucracy and other pro-capitalist opponents of neoliberalism, whose aims and interests are quite different from theirs. An independent path is also needed because, if there is a pro-capitalist solution to the malaise other than letting it run its course, no one yet knows what it is. The system’s leading economists are just now waking up to the possibility that our present predicament is not a mere after-effect of a financial crisis. Austerity policies haven’t extricated the economy from the slump but, as the U.S. case shows, neither have wildly expansionary fiscal and monetary policies. Class struggles, taking a variety of traditional and new forms, have accelerated throughout the world during the crisis, and a late 2011 Pew Research Center poll of U.S. residents found that a large majority of black people, a majority of people under 30, and almost half of low-income people and Hispanics had a positive perception of socialism. 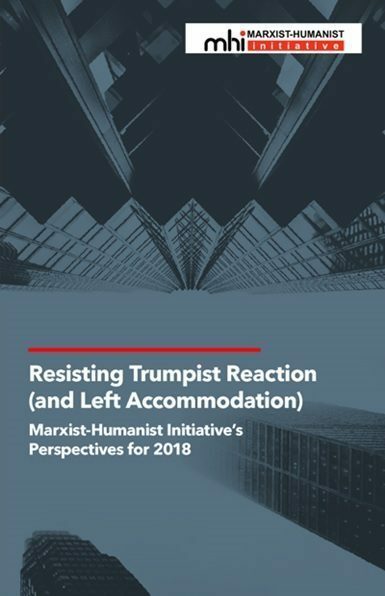 The problem is that these struggles have been derailed and confined by attempts to integrate them into the anti-neoliberal-but-pro-capitalist project, and that most of the Left, including the ‘socialist’ Left, has been backing these attempts instead of listening to the renewed aspiration for a socialist future. Andrew Kliman is the author of The Failure of Capitalist Production: Underlying Causes of the Great Recession (Pluto Press, 2011) and Reclaiming Marx’s ‘Capital’: A Refutation of the Myth of Inconsistency (Lexington Books, 2007). A professor of economics at Pace University (New York), he works politically with the Marxist-Humanist Initiative. Andrew Kliman, The Failure of Capitalist Production: Underlying Causes of the Great Recession (London: Pluto Press, 2011), pp. 38–47. The consumer-credit and home-mortgage borrowing figures are reported in lines 44 and 43, respectively, of Table F.100 of the Federal Reserve’s Financial Accounts of the United States. Personal consumption expenditures are reported in line 2 of National Income and Product Accounts (NIPA) Table 1.1.5. See Table 1 of the Federal Reserve Bank of San Francisco’s 2007 annual report, The Subprime Mortgage Market: National and Twelfth District Developments. The equity-extraction estimates are reported in line 109 of Table 2 of their paper. See figures for the 50th percentile in Table A-1. The earnings data are reported in the Census Bureau’s Historical Income Tables P-45 and P-45A. To make them as comparable as possible to the figures reported in the CBO study, which used the personal consumption expenditures price index (reported in NIPA Table 1.1.4, line 2) to adjust for inflation, I used it as well. Total compensation and wage data are reported in NIPA Table 2.1, lines 2 and 3, respectively. Corporations’ net value added and compensation data are reported in NIPA Table 1.14, lines 3 and 4, respectively. Business-sector net value added is reported in NIPA Table 1.9.5, line 2, while total business-sector compensation is the sum of lines 3 and 11 of NIPA Table 1.13. I have used net value added and net domestic product figures here and below, rather than the corresponding gross figures, because the latter include depreciation, which is a cost, not a component of profit or compensation income. Interest, dividend, rental, and proprietors’ income are reported in NIPA Table 2.1, lines 14, 15, 12, and 9, respectively. Compensation of employees is reported in line 2, government social benefits in line 17, and social insurance taxes in line 25 of the same table. Net Domestic Product is reported in line 29 of NIPA Table 1.7.5. 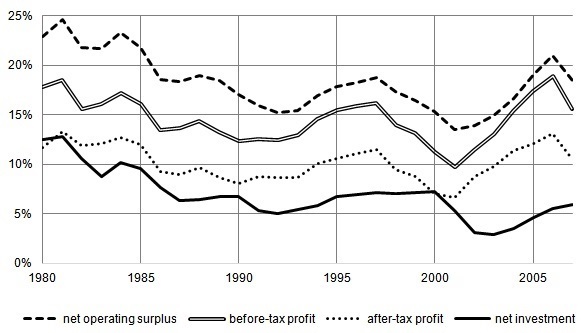 My measure of net operating surplus is gross value added minus historical cost-depreciation of fixed assets, compensation of employees, and ‘taxes on production and imports[,] less subsidies.’ Before-tax profit is net operating surplus minus net interest (and miscellaneous) payments and transfer payments. After-tax profit is before-tax profit minus corporate income taxes. Gross value added, compensation, ‘taxes on production [etc. ],’ interest payments, transfer payments, and income taxes are reported in NIPA Table 1.14, lines 1, 4, 7, 9, 10, and 12, respectively. The depreciation data are reported in the Bureau of Economic Analysis’ Fixed Assets Accounts Table 6.6, line 2. The rates of profit express the profit measures as percentages of corporations’ accumulated investment in fixed assets, net of depreciation––their ‘historical-cost net stock’—reported in Fixed Assets Accounts Table 6.3, line 2. Net investment is (gross) investment minus historical-cost deprecation, reported in Fixed Assets Accounts Tables 6.7, line 2, and 6.6, line 2, respectively.